Make any occasion special – Birthdays, Hen Parties, Office Celebrations, Baby Showers, Christenings. 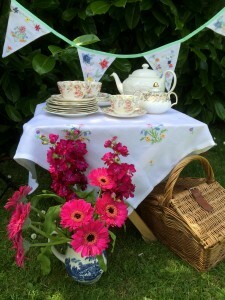 Included in your hamper will be vintage cups and saucers, tea plates, cake stands, bowls of jam and cream, teaspoons, cake forks, teaspoons, linen napkins, table cloth, teapot, flask of milk and milk jug, sugar bowl and tongs. We’ve thought of everything, it will be delivered in hampers/baskets – just unpack and enjoy and we will collect at a mutually convenient time. Food is prepared in our FSA 5 rated kitchen. Please look at the Bespoke Tea Party page for some ideas to personalise your event above and beyond our standard Vintage Afternoon Tea delivery. You can collect and drop off your Afternoon Tea from Denvilles (PO9 2FD) at no extra cost, or for £10 we deliver within a 10 mile radius from here or please contact me for a quote. We will collect the hamper from you within a couple of days of your event, at a mutually agreed time. We can deliver to a variety of locations, from parks, beaches and boats. We will discuss at the time of booking if fine china is appropriate for your location, if not, we will discuss alternatives with you. We cater for 2 to 100 people, providing all the food needed together with our beautiful china. Vouchers are available (minimum of 2 persons). They can be personalised with handwritten calligraphy and sent to you or directly to the recipient – once payment has been received. Please note the recipient needs to live within the delivery area or ask for a delivery quote.